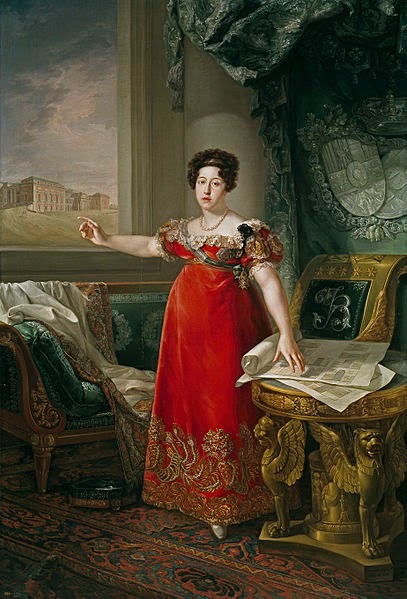 It seems that not a day goes by without us meeting one of the many wives of King Ferdinand VII of Spain and today it is my pleasure to introduce you to the second of that illustrious group in as many days! Like two of the fellows, her life was short and her death tragic. Born to John VI of Portugal and his wife, Carlota Joaquina of Spain, it was always intended that the young Infanta would one day make someone an excellent dynastic match. She was raised in preparation for that destiny, and developed an abiding passion for the arts. Before she was too old, it was decided that the gentleman in question would be her maternal uncle, Ferdinand VII. Ten years a widower and with no heir, the king of Spain was in need of a wife and family and his niece fit the bill perfectly. The couple were married on 29th September 1816 when the bride was 19 years old, her groom thirteen years her senior. The newlyweds got along nicely enough and before too much time had passed, news began to circulate that the queen was with child. She gave birth to a daughter in August 1817 but the little girl died before she was six months old. With the court still waiting for an heir, the young queen once again announced her pregnancy but once again the outcome was to be tragic. The December birth of the second child was long and painful and the breeched baby was stillborn. Thinking the queen also dead, her physicians began to operate to remove the deceased infant. In fact, Maria Isabel was alive and she cried out in agony, bleeding profusely from her abdomen. The unfortunate young woman passed away that same evening, leaving Ferdinand a widow for the second time. In 1819, the late queen's collection of art formed the basis of the newly opened Museo del Prado. Dedicated to her memory, Ferdinand later commissioned the portrait above showing his wife before the museum that was built in her honour. Childbirth was a hazardous enterprise, even for a queen.